Citation: McCammon JG, Trivedi MK, Branton A, Trivedi D, Nayak G, et al. Role of Biofield Energy Treated Vitamin D3 in Human Bone Osteosarcoma Cells(MG-63): A Multidisciplinary Aspect on Bone Health. J Emerg Med Critical Care 2018;4(1): 6. Copyright © 2018 McCammon JG, et al. This is an open access article distributed under the Creative Commons Attribution License, which permits unrestricted use, distribution, and reproduction in any medium, provided the original work is properly cited. Study the impact of Biofield Treated vitamin D3 and DMEM on bone health in human bone osteosarcoma cells (MG-63) was investigated. The test items (TI), were distributed into two parts. One part of each sample was received the Consciousness Energy Healing Treatment by Julia Grace McCammon, and those samples were labeled as Biofield Treated (BT) samples, while other parts of each sample were denoted as untreated test items (UT), where did not provide any types of treatment. Cell viability showed test samples were found as safe in tested concentrations. ALP was significantly increased by 210.4% and 221.6% in UT-DMEM+BT-TI and BT-DMEM+BT-TI respectively at 0.1 μg/mL, while increased by 207.9% in BT-DMEM+UT-TI compared to UT-DMEM+UT-TI. Collagen was significantly increased by 158.46%, 129.23%, and 138.46% in UT-DMEM+BT-TI, BT-DMEM+UT-TI, and BT-DMEM+BT-TI respectively at 1 μg/mL compared to untreated. Moreover, level of collagen was significantly enhanced by 101.37%, 157.53%, and 176.71% in UT-DMEM+BT-TI, BT-DMEM+UT-TI, and BT-DMEM+BT-TI respectively at 10 μg/mL compared to untreated. Besides, the percent of bone mineralization was remarkably increased by 70.59% and 151.18% in the BT-DMEM+UT-TI and BT-DMEM+BT-TI respectively at 100 μg/mL, while increased by 117.17% in UT-DMEM+BT-TI at 1 μg/mL than untreated. Altogether, the Biofield Energy Treated vitamin D3 was significantly improved the bone cell growth-related parameters. It could be used as an alternative supplement for vitamin D3 deficiency on various bone-related disorders (osteoporosis, low bone density, Paget’s disease, rickets, osteomalacia), stress, aging, autoimmune, and inflammatory disorders. In most of the living vertebrates, vitamin D3 (cholecalciferol) plays a vital role maintaining a healthy skeletal system and is essential for bone cell growth and development. Naturally, it is synthesized in the presence of sunlight . Vitamin D receptor (VDRs) are widely distributed in different body organs such as liver, lungs, brain, heart, pancreas, kidney etc. and regulates different functions. It was well proven that it has a significant anti-arthritic, anti-inflammatory, anti-stress, anti-aging, anti-osteoporosis, wound healing, anti-apoptotic, anti-cancer, etc. . The active metabolites of vitamin D3 bind with the active site of the VDRs and can influence communication from one cell to other cells, hormonal balance, neurotransmission process, skin health, cell proliferation, immune and cardiovascular functions . Bone strength depends on the mineral content, microarchitecture, and the collagen content. Collagen is one of the major structural proteins responsible for bone calcification. In aging, the mechanical properties of the bones become reduced and the bones get fragile, that causes various clinical disorders associated with bone collagen abnormalities and bone fragility, such as osteogenesis imperfecta and osteoporosis [4,5]. Deficiency of vitamin D3 in aged peoples can causes metabolic bone diseases like osteomalacia, osteoporosis, etc. and also decrease in muscle strength with definite alteration in the immune and inflammatory responses [6,7]. This metabolic bone disorders are mainly prevalent in post-menopausal women, due to rapid bone loss and change of endocrine secretions in post-menopausal women leads to an increased risk of fractures . That is why, calcium and alkaline phosphatase (ALP) levels in post-menopausal women are the main two vital biomarkers of bone metabolism and in osteoblast differentiation . Besides, it is well-established that adequate intake of calcium intake and vitamin D important for maintaining good bone health. Vitamin D also plays a vital role in regulating an adequate level of calcium and phosphorus [10,11]. Numerous research data reported that Biofield Energy Treatment have shown to enhance immune function in cancer patients through therapeutic touch, massage therapy, etc. [12,13]. Complementary and Alternative Medicine (CAM) therapies are now rising trend of treatment, among which Biofield Therapy (or Healing Modalities) is one of them approach that has been contributed to enhance physical, mental and emotional human wellness. National Health Interview Survey (NHIS) in 2012 reported that about 20% Americans are using dietary supplements as a complementary health approach as compared with conventional therapy in past years. On the other hand, The National Center of Complementary and Integrative Health (NCCIH) has recommended Biofield Energy Healing as a CAM health care approach. Other therapies and practices already included under CAM such as natural products, yoga, Qi Gong, deep breathing, Tai Chi, chiropractic/osteopathic manipulation, meditation, massage, special diets, homeopathy, progressive relaxation, acupressure, guided imagery, acupuncture, relaxation techniques, hypnotherapy, rolfing structural integration, healing touch, movement therapy, pilates, mindfulness, cranial sacral therapy, Ayurvedic medicine, traditional Chinese herbs and medicines, essential oils, aromatherapy, Reiki, naturopathy, etc. CAM therapies have been practiced worldwide with reported clinical benefits in different health disease profiles [14,15]. The Biofield Energy can be harnessed from the environment and transmitted by the experts into living and non-living things via the process of Biofield Energy Healing Treatment (a unique thought transmission technique). The effect of the Consciousness Energy Healing Treatment (The Trivedi Effect®) has been contributes numerous works in different peer-reviewed scientific journals with outstanding outcomes in a wide varieties of fields like inmicrobiology, cancer research, biotechnology, agricultural science, pharmaceutical science, materials science, skin health, nutraceuticals, human health and wellness [16-36]. Based on the above informations, authors planned this experiment to evaluate the impact of the Biofield Energy Treatment (The Trivedi Effect®) on the test samples (vitamin D3 and DMEM medium) for bone health activity with respect to ALP, collagen content, and bone mineralization using standard assays in MG-63 cells. Fetal bovine serum (FBS) and Dulbecco's Modified Eagle's Medium (DMEM) were purchased from Life Technology, USA. Rutin hydrate was purchased from TCI, Japan, while vitamin D3 (denoted as test item) and L-ascorbic acid were obtained from Sigma-Aldrich, USA. Antibiotic solution (penicillin-streptomycin) was procured from HiMedia, India, while 3-(4, 5-dimethyl-2-thiazolyl)-2, 5-diphenyl-2H-tetrazolium) (MTT), Direct Red 80, and ethylenediaminetetraacetic acid (EDTA) were purchased from Sigma, USA. Rest-over chemicals used in this study were analytical grade obtained from India. The test system, human bone osteosarcoma (MG-63) cell line, (ATCC® CRL-1427™) obtained from Sigma, India, maintained under the DMEM growth medium for routine culture and supplemented with 10% FBS. Growth conditions were maintained at 37 °C, 5% CO2 and 95% humidity and sub-cultured by trypsinisation followed by splitting the cell suspension into fresh flasks. Three days prior to experiment (i.e. Day 3), the growth medium of near-confluent cells was replaced with fresh phenol-free DMEM, supplemented with 10% charcoal dextran stripped FBS (CD-FBS) and 1% penicillin-streptomycin . The study groups contained of cells in baseline control (untreated cells), vehicle control (0.05% DMSO with Biofield Energy Treated and untreated DMEM), a positive control (rutin hydrate) and experimental test groups. The experimental test groups included the combination of the untreated and Biofield Energy Treated vitamin D3/DMEM. It consisted of four treatment groups viz. untreated DMEM (UT-DMEM)+untreated test item (UT-TI), UT-DMEM+Biofield Energy Treated test item (BT-TI), BT-DMEM+UT-TI, and BT-DMEM+BT-TI. Experiment was performed in triplicates and the data were represented as percent change/protection. Vitamin D3 was weighed and dissolved in suitable solvent at 10 mM-50 mM (based on the requirement of the assay). Stock solution was further diluted in SFM to treat cells. Besides, commercially supplied DMEM was dissolved in 800 mL of distilled water. Added calculated amount of NaHCO3, adjusted pH (7.2-7.4), and 10 mL of penicillin/streptomycin were added to make final volume 1 L. Then, filtered into sterile flasks using 0.2 μm filter using peristaltic pump and checked for sterility by incubating in a CO2 incubator for 24 hours. Then, stored the content at 2-8 °C till used. Here, concentration (μg/mL) of vitamin D3 was used as specific amount and mixed in DMEM during experiment. The test item (vitamin D3 and DMEM was divided into two parts. One part each of the test item was treated with the Biofield Energy and coded as the Biofield Energy Treated items, while the second part did not receive any sort of treatment and was defined as the untreated samples. However, for better comparison the control group was treated with a sham healer. The ‘sham healer’ did not have any knowledge about the Biofield Energy Healing Treatment. The Biofield Energy Healing Treatment was provided by Julia Grace McCammon remotely for ~5 minutes through the healer’s unique Energy Transmission process to the test samples under laboratory conditions. Healer, remotely located in the Canada, while the test samples were located in the Dabur Research Foundation, a sophisticated research laboratory, New Delhi, India. Moreover, Healer neither visited the laboratory in person, nor had any contact with the test items. After that, the Biofield Energy Treated and untreated samples were kept in a proper storage conditions until end of the experiment. The concentration exhibiting ≥70% cell viability was appraised as non-cytotoxic . R = Absorbance in cells corresponding to untreated group. The obtained data were expressed as percentage (%) of the respective study parameters. Sigma-Plot (version 11.0) was used as a statistical tool for data interpretation. Statistically significant values were set at the level of p≤0.05. 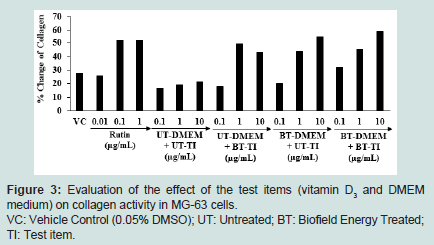 The test items (Biofield Energy Treated vitamin D3 and DMEM) were analyzed for the assessment of cytotoxicity in MG-63 cells and the results are shown in Figure 1. The cell viability results showed that the test items was observed as safe and nontoxic (as evidence of cell viability more than 73%) across all the tested concentrations up to 100 μg/mL. Hence, the selected safe concentrations were used further evaluation of alkaline phosphatase (ALP) activity, collagen synthesis, and bone mineralization in MG-63 cells. ALP is one of the superior bone marker proteins for osteoblast differentiation . Bone mass is maintained through simultaneously destruction and rebuilding of bone is controlled by osteoblasts and osteoclasts . The effect of the test items on ALP activity in MG-63 cells is shown in Figure 2. The vehicle control (VC) group showed 13.2% level of ALP activity as compared to the untreated cells group. The ALP activity was significantly increased by 33.97%, 45.69% and 79.66% in the positive control (rutin) group in a dose-dependent manner at the concentration of 0.01, 0.1, and 1 μg/mL, respectively compared to the untreated cells group. The level of ALP was significantly increased by 210.4% and 221.6% in the UT-DMEM+BT-Test item and BT-DMEM+BT-Test item groups, respectively at 0.1 μg/mL with respect to the UT-DMEM+UT-Test item group. Further, the level of ALP was significantly increased by 13.8% and 7.5% in the BT-DMEM+BT-Test item group at 1 and 10 μg/mL, respectively compared to the UT-DMEM+UT-Test item group. Moreover, at 50 μg/mL ALP level was significantly increased by 207.9% in the BT-DMEM+UT-Test item group compared to the UT-DMEM+UT-Test item group (Figure 2). As ALPs contains zinc, which encoded by a multigene family and function like a dimeric molecules. Apart from Zn2+, Mg2+ also present in the active site that are responsible for enzymatic activity. It is assumed that might be the Biofield Energy can enhanced the activity of both zinc and magnesium ions to ALP enzymes activity by changing a conformational monomer . Overall, the Consciousness Energy Treated (The Trivedi Effect®) vitamin D3 showed an improved synthesis of ALP in the human osteosarcoma cells with respect to the untreated item items group, which might be advantageous to maintain a healthy skeletal structure for the patients suffering from various bone-related disorders. 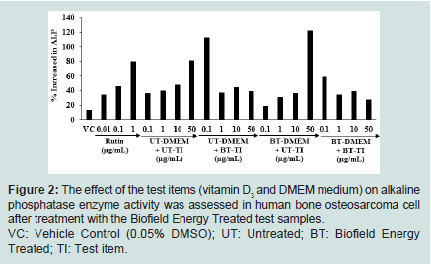 Figure 2: The effect of the test items (vitamin D3 and DMEM medium) on alkaline phosphatase enzyme activity was assessed in human bone osteosarcoma cell after treatment with the Biofield Energy Treated test samples. VC: Vehicle Control (0.05% DMSO); UT: Untreated; BT: Biofield Energy Treated; TI: Test item. The response of the test samples on the collagen activity in MG-63 cells is shown in Figure 3. Vehicle control group showed 27.9% increased the level of collagen as compared to the untreated cells (normal control) group. The level of collagen synthesis was significantly increased by 25.81%, 51.61%, and 51.91% at 0.01, 0.1, and 1 μg/mL, respectively in the positive control (rutin) group compared to the untreated cells group. The collagen synthesis was significantly increased by 7.02%, 19.30%, and 92.98% in the UT-DMEM+BT-Test item, BT-DMEM+UT-Test item, and BT-DMEM+BT-Test item groups, respectively at 0.1 μg/mL compared to the UT-DMEM+UT-Test item group. Moreover, the collagen level was significantly increased by 158.46%, 129.23%, and 138.46% in the UT-DMEM+BT-Test item, BT-DMEM+UT-Test item, and BT-DMEM+BT-Test item groups, respectively at 1 μg/mL compared to the UT-DMEM+UT-Test item group. Additionally, at 10 μg/mL the level of collagen was also significantly increased by 101.37%, 157.53% and 176.71% in the UT-DMEM+BT-Test item, BT-DMEM+UT-Test item, and BT-DMEM+BT-Test item groups, respectively with respect to the UT-DMEM+UT-Test item group (Figure 3). It is well known that severe vitamin D deficiency leads to rickets in children and osteomalacia in adults . The cell replication and matrix protein synthesis i.e. collagen are also modulated by vitamin D . In addition to the maintenance of calcium and phosphorus balance, vitamin D regulates the function of the kidneys, heart, and immune system. Moreover, its anti-inflammatory, antiapoptotic, and antifibrotic roles have gained considerable attention . Overall, the Consciousness Energy treated vitamin D3 had significantly improved the synthesis of collagen fibers in the human osteosarcoma cells with respect to all the treatment groups. Hence, it is assumed that The Trivedi Effect® has the significant potential to improve the bone health in various skeletal disorders. 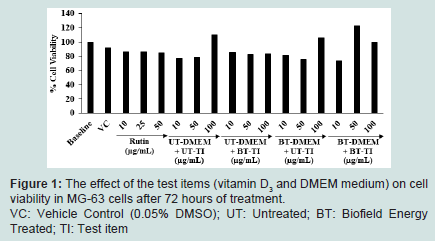 Figure 3: Evaluation of the effect of the test items (vitamin D3 and DMEM medium) on collagen activity in MG-63 cells. VC: Vehicle Control (0.05% DMSO); UT: Untreated; BT: Biofield Energy Treated; TI: Test item. Natural bone growth and mineralization is depends on the sufficient abundance of calcium and phosphate. While, deficient of bone mineralization can leads to various bone-related disorders like rickets, osteomalacia, osteoporosis etc. . Osteoporosis is a bone disorder associated with increased morbidity and mortality. Vitamin D is essential for calcium absorption and bone mineralization which is truly associated with bone mineral density . The effect of the test items on mineralization of bone in MG-63 cells is shown in Figure 4. The vehicle control (VC) group showed 3.6% increased bone mineralization as compared to the untreated cells (normal control) group. The percentage of bone mineralization was significantly increased in a concentration-dependent manner by 50.46%, 86.16%, and 130.60% at 5, 10 and 25 μg/mL, respectively in the positive control group compared to the untreated cells group. The percent of bone mineralization was remarkably increased by 117.17% in the UT-DMEM+BT-Test item group at 1 μg/mL compared to the UT-DMEM+UT-Test item group. Further, a significant increased the percentage of bone mineralization by 2.29% and 17.43%in the BT-DMEM+UT-Test item and BT-DMEM+BT-Test item groups, respectively at 10 μg/mL with respect to the UT-DMEM+UT-Test item group. In addition to, the data showed a significant increased of percent bone mineralization by 16.14% and 2.76% in the BT-DMEM+UT-Test item and BT-DMEM+BT-Test item groups, respectively than the UT-DMEM+UT-Test item group at 50 μg/mL. Moreover, the percentage of bone mineralization was remarkably raised by 70.59% and 151.18% in the BT-DMEM+UT-Test item and BT-DMEM+BT-Test item groups, respectively than the UT-DMEM +UT-Test item group at 100 μg/mL. Based on the above findings, it is assumed that the Biofield Energy Treated vitamin D3 showed a significant improvement of bone mineralization content assessed by in vitro in the human osteosarcoma cells (MG-63) with respect to the all others treatment groups (Figure 4). 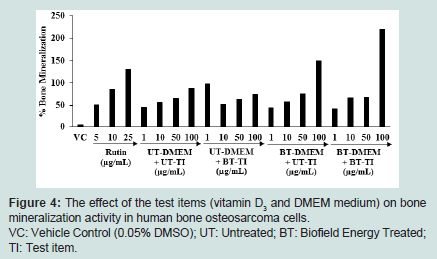 Figure 4: The effect of the test items (vitamin D3 and DMEM medium) on bone mineralization activity in human bone osteosarcoma cells. VC: Vehicle Control (0.05% DMSO); UT: Untreated; BT: Biofield Energy Treated; TI: Test item. The cytotoxicity assay (MTT) data showed more than 73% cells were viable, which indicated the test samples were safe and nontoxic in the tested concentrations. ALP was significantly elevated by 210.4% and 221.6% in the UT-DMEM+BT-TI and BT-DMEM+BT-TI, respectively at 0.1 μg/mL, however increased by 207.9% in the BT-DMEM+UT-TI at 50 μg/mL than UT-DMEM+UT-TI. Collagen was significantly increased by more than 100% in all the treatment groups at different concentrations than untreated. Besides, the percent of bone mineralization was remarkably increased by 151.18% in the BT-DMEM+BT-TI at 100 μg/mL, while increased by 117.17% in the UT-DMEM+BT-TI at 1 μg/mL compared to the untreated group. Altogether, the Biofield Treated test items possess a significant impact on bone health parameters. Thus, the Consciousness Energy Healing-based vitamin D3 might be suitable for the development of an alternative supplement in vitamin D3 deficiency cases, which could be used for the management of various bone-related disorders viz. Paget’s disease, osteogenesis imperfecta, osteoporosis, osteomalacia, rickets, bone fractures, bone and joint pain, deformed bones, etc. Moreover, it can also be utilized on organ transplants (liver, kidney, and heart transpant), autoimmune disorders (Myasthenia Gravis, Addison Disease, Dermatomyositis, Aplastic Anemia, Pernicious Anemia, Graves’ Disease, Hashimoto Thyroiditis, Multiple Sclerosis, different types of Arthritis, Systemic Lupus Erythematosus, Type 1 Diabetes, Vitiligo, Crohn’s Disease, Fibromyalgia, Psoriasis, Scleroderma, Vasculitis). It can also be useful against an inflammatory disorders (irritable bowel syndrome, ulcerative colitis), anti-aging Atherosclerosis, wound healing, anti-stress, anti-cancer, and Parkinson’s disease, etc. near future. Authors are grateful to Trivedi Global, Inc., Trivedi Science, Trivedi Testimonials, Trivedi Master Wellness, and Dabur Research Foundation (DRF) for their support throughout the work. Holick MF (1996) Vitamin D and bone health. J Nutr 126 (4 Suppl): S1159-S1164. Holick MF (2004) Sunlight and vitamin D for bone health and prevention of autoimmune diseases, cancers, and cardiovascular disease. Am J Clin Nut 80 (6 Suppl): S1678-S1688. Matsuoka LY, Ide L, Wortsman J, MacLaughlin JA, Holick MF (1987) Sunscreens suppress cutaneous vitamin D3 synthesis. J Clin Endocrinol Metab 64: 1165-1168. Barnes MS, Robson PJ, Bonham MP, Strain JJ, Wallace JM (2006) Vitamin D: status, supplementation and immunodulation. Curr Nutr Food Sci 2: 315-336. Laird E, Ward M, McSorley E, Strain JJ, Wallace J (2010) Vitamin D and bone health: potential mechanisms. Nutrients 2: 693-724. Bhattarai T, Bhattacharya K, Chaudhuri P, Sengupta P (2014) Correlation of common biochemical markers for bone turnover, serum calcium, and alkaline phosphatase in post-menopausal women. Malays J Med Sci 21: 58-61. Favus MJ (1990) Primer on the metabolic bone diseases and disorders of mineral metabolism. American Society for Bone and Mineral Research, Washington, USA, pp.1-297. DeLuca HF (2004) Overview of general physiologic features and functions of vitamin D. Am J Clin Nutr 80 (6 Suppl): S1689-S1696. Lutgendorf SK, Mullen-Houser E, Russell D, Degeest K, Jacobson G, et al. (2010) Preservation of immune function in cervical cancer patients during chemoradiation using a novel integrative approach. Brain Behav Immun 24: 1231-1240. Ironson G, Field T, Scafidi F, Hashimoto M, Kumar M, et al. (1996) Massage therapy is associated with enhancement of the immune system's cytotoxic capacity. Int J Neurosci 84: 205-217. Jain S, Hammerschlag R, Mills P, Cohen L, Krieger R, et al. (2015) Clinical studies of biofield therapies: summary, methodological challenges, and recommendations. Glob Adv Health Med 4 (Suppl): 58-66. Trivedi MK, Branton A, Trivedi D, Nayak G, Mondal SC, et al. (2015) Antimicrobial sensitivity, biochemical characteristics and biotyping of Staphylococcus saprophyticus: an impact of biofield energy treatment. J Women’s Health Care 4: 271. Trivedi MK, Branton A, Trivedi D, Nayak G, Mondal SC, et al. (2015) Phenotyping and 16S rDNA analysis after biofield treatment on Citrobacter braakii: a urinary pathogen. J Clin Med Genomics 3: 129. Trivedi MK, Branton A, Trivedi D, Nayak G, Mondal SC, et al. (2015) Morphological characterization, quality, yield and DNA fingerprinting of biofield energy treated alphonso mango (Mangifera indica L.). J Food Nutr Sci 3: 245-250. Trivedi MK, Branton A, Trivedi D, Nayak G, Mondal SC, et al. (2015) Evaluation of plant growth, yield and yield attributes of biofield energy treated mustard (Brassica juncea) and chick pea (Cicer arietinum) seeds. Agric For Fish 4: 291-295. Trivedi MK, Branton A, Trivedi D, Nayak G, Mondal SC, et al. (2015) Evaluation of plant growth regulator, immunity and DNA fingerprinting of biofield energy treated mustard seeds (Brassica juncea). Agric For Fish 4: 269-274. Branton A, Jana S (2017) The influence of energy of consciousness healing treatment on low bioavailable resveratrol in male Sprague Dawley rats. Intl J Clin Dev Anat 3: 9-15. Branton A, Jana S (2017) The use of novel and unique biofield energy healing treatment for the improvement of poorly bioavailable compound, berberine in male Sprague Dawley rats. Am J Clin Exp Med 5: 138-144. Branton A, Jana S (2017) Effect of the biofield energy healing treatment on the pharmacokinetics of 25-hydroxyvitamin D3 [25(OH)D3] in rats after a single oral dose of vitamin D3. Am J Pharmacol Phytother 2: 11-18. Trivedi MK, Branton A, Trivedi D, Nayak G, Gangwar M, et al. (2016) Molecular analysis of biofield treated eggplant and watermelon crops. Adv Crop Sci Technol 4: 208. Trivedi MK, Tallapragada RM, Branton A, Trivedi D, Nayak G, et al. (2015) Characterization of physical and structural properties of aluminum carbide powder: impact of biofield treatment. J Aeronaut Aerosp Eng 4: 142. Trivedi MK, Nayak G, Patil S, Tallapragada RM, Latiyal O, et al. (2015) Impact of biofield treatment on atomic and structural characteristics of barium titanate powder. Ind Eng Manag 4: 166. Trivedi MK, Patil S, Nayak G, Jana S, Latiyal O (2015) Influence of biofield treatment on physical, structural and spectral properties of boron nitride. J Mater Sci Eng 4: 181. Kinney JP, Trivedi MK, Branton A, Trivedi D, Nayak G, et al. (2017) Overall skin health potential of the biofield energy healing based herbomineral formulation using various skin parameters. Am J Life Sci 5: 65-74. Singh J, Trivedi MK, Branton A, Trivedi D, Nayak G, et al. (2017) Consciousness energy healing treatment based herbomineral formulation: a safe and effective approach for skin health. Am J Pharmacol Phytother 2: 1-10. Arslan S, Ugurlu S, Bulut G, Akkurt I (2010) The association between Plasma D-dimer levels and community-acquired pneumonia. Clinics (Sao Paulo) 65: 593-597. Mahendra KT, Rama MT, Alice B, Dahryn T, Gopal N, et al. (2015) Biofield treatment: a potential strategy for modification of physical and thermal properties of gluten hydrolysate and ipomoea macroelements. J Nutr Food Sci 5: 414. Allen KB, Trivedi MK, Branton A, Trivedi D, Nayak G, et al. (2018) Biofield energy healing based vitamin D3: an improved overall bone health activity in MG-63 cell line. Trends Tech Sci Res 2: 555578. Franceschi RT, Iyer BS (1992) Relationship between collagen synthesis and expression of the osteoblast phenotype in MC3T3-E1 cells. J Bone Miner Res 7: 235-246. Liu SC, Trivedi MK, Branton A, Trivedi D, Nayak G, et al. (2018) Implication of biofield energy healing based vitamin D3 on osteoblastic differentiation. Int J Immunol 5: 88-96. Parulkar VR, Trivedi MK, Branton A, Trivedi D, Nayak G, et al. (2018) Improved metabolism of vitamin D3 in human osteoblasts cells after biofield energy healing treatment. Am J Lab Med 3: 11-19. Slade TC, Trivedi MK, Branton A, Trivedi D, Nayak G, et al. (2018) Effects of vitamin D3 on the proliferation and mineralization of human osteoblast-like cells: implications of biofield energy healing treatment. Eur J Prev Med 6: 4-12. Harada S, Rodan GA (2003) Control of osteoblast function and regulation of bone mass. Nature 423: 349-355. Hoylaerts MF, Manes T, Millán JL (1997) Mammalian alkaline phosphatases are allosteric enzymes. J Biol Chem 272: 22781-22787. Misra M, Pacaud D, Petryk A, Collett-Solberg PF, Kappy M, et al. (2008) Vitamin D deficiency in children and its management: review of current knowledge and recommendations. Pediatrics 122: 398-417. Schwartz Z, Schlader DL, Ramirez V, Kennedy MB, Boyan BD (1989) Effects of vitamin D metabolites on collagen production and cell proliferation of growth zone and resting zone cartilage cells in vitro. J Bone Miner Res 4: 199-207. Lai Y, Fang T (2013) The pleiotropic effect of vitamin D. Int Sch Res Notices Nephrol vol. 2013: 1-6. Pitt MJ (1991) Rickets and osteomalacia are still around. Radiol Clin North Am 29: 97-118. McCammon JG, Trivedi MK, Branton A, Trivedi D, Nayak G, et al. Role of Biofield Energy Treated Vitamin D3 in Human Bone Osteosarcoma Cells (MG-63): A Multidisciplinary Aspect on Bone Health. J Emerg Med Critical Care 2018;4(1): 6.